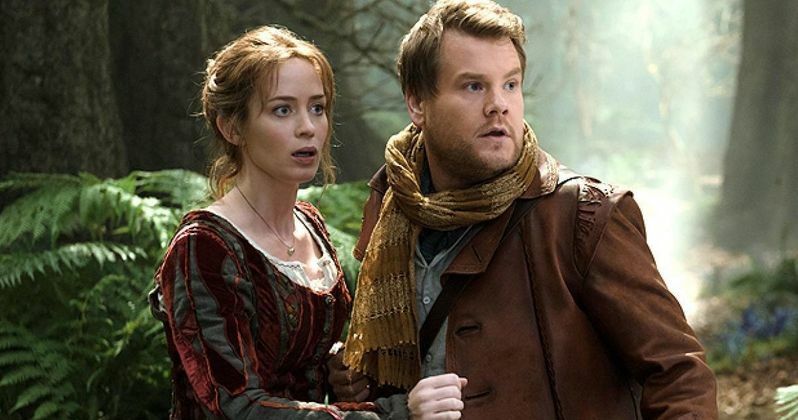 Following the photos that debuted yesterday, Walt Disney Pictures has released the first trailer for their upcoming musical Into the Woods, which hits theaters on December 25. Based on the Stephen Sondheim Broadway musical and directed by Rob Marshall (Chicago), Into the Woods combines classic tales such as Cinderella (Anna Kendrick), Little Red Riding Hood (Lilla Crawford) and the Big Bad Wolf (Johnny Depp), Jack and the Beanstalk (Daniel Huttlestone), Rapunzel (Mackenzie Mauzy) and many more with an original story about a baker (James Corden) and his wife (Emily Blunt) trying to remove a curse placed on them by an evil witch (Meryl Streep). Take a look at the first footage before this musical hits theaters on Christmas Day. Into the Woods is a modern twist on several of the beloved Brothers Grimm fairy tales, intertwining the plots of a few choice stories and exploring the consequences of the characters' wishes and quests. This humorous and heartfelt musical follows the classic tales of s Cinderella (Anna Kendrick), Little Red Riding Hood (Lilla Crawford), Jack and the Beanstalk (Daniel Huttlestone) and Rapunzel (Mackenzie Mauzy)-all tied together by an original story involving a baker and his wife (James Corden & Emily Blunt), their wish to begin a family and their interaction with the witch (Meryl Streep) who has put a curse on them.